Do you get cold when you’re reading books that happen in the Arctic, or get the creepy-crawlies when you read about ants? Then maybe you want to have a glass of water nearby when you start today’s book, which you ought to do at the first possible opportunity. Set in the exquisitely thirsty city of Ghadid, K.A. 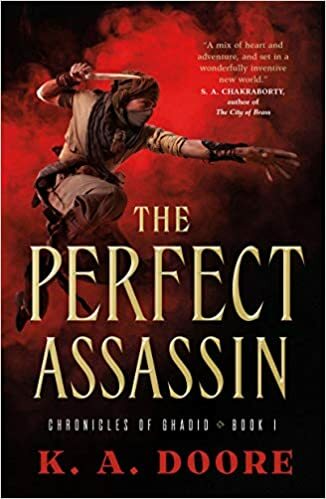 Doore’s masterful debut The Perfect Assassin follows newly-minted assassin Amastan as he races to solve a murder mystery while dealing with his own reservations about his chosen profession. Things just get more complicated when he steps in to save a mysterious stranger from a roaming janni–a handsome mysterious stranger. Reader, we all know how I feel about anxious assassins, handsome mysterious strangers, and roaming furious spirits of the dead. And let me tell you: things just get better from there. What kinds of awesome can you expect in this book? Rooftop fights! Jumps! Rope climbs! Things to make the acrophobic amongst us (me!) gasp a lot! Ghadid itself. I felt like I had actually traveled there, an experience that few books give me. To explain what I mean by using entirely different genres: McCall Smith’s Ladies’ Detective series contains the same sort of immersive sense of place, to the extent that I will sometimes catch myself saying “I think I want to go to Botswana” when I mean I want to re-read. I can foresee that I’ll be saying “I think I want to go to Ghadid today”. Doore has an excellent sense of characterization and dialogue, a deft touch with pathos, and a very good nose for action. All in all, it was a treat to read–a big, sandswept, heart-rending treat.